N.K Industries Is Forerunner Manufacturer & Supplier Of Range Of Liquid Filling Machine Based In Ahmedabad, India. This Liquid Filling Machine Works On Volumetric Principal To Fill The Container. This Liquid Filling Machine Is Prevalently Refereed As Bottle Filling Machine As This Type Of Liquid Filling Machine Are Comprehensively Used To Fill The Rigid Container Like Glass Bottle, PET Bottle And Plastic Bottle. 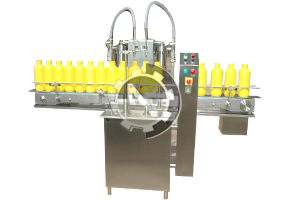 Our Range Of Bottle Liquid Filling Machine Are Available In Various Configuration Like 2 Head , 4 Head , 6 Head , 8 Head And 12 Head In Order To Meet The Production Requirement Of Customer. Machine Can Fill 5 Ml To 500 Ml In Single Stroke And 1000 Ml With Double Strock. Most Prominent Features Of Our State Of The Art Liquid Filling Machine Is The NO Bottle – NO Cap System And All Electronics Are CE Certified.